Mayo Hall is a remarkable brick and mortar structure built in memory of the fourth Viceroy of India (1872), Lord Mayo, next to the Public Utility Building on the Mahatma Gandhi Road, Bangalore. This two story building is decorated with Italian chandeliers, ornate furniture, exquisite furnishings, architrave, pediment windows, key stoned arches, balustrade ledges, beautiful consoles, Greek cornices, Tuscan columns and wooden floors. 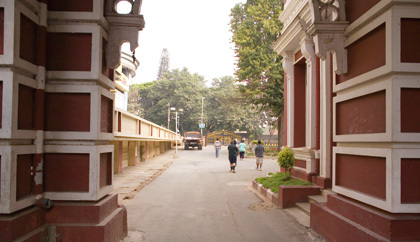 Mayo Hall is now home to numerous departments of BMP (Bangalore Mahanagara Palike). This hall, which lies on a hill, offers panoramic view of the Parade grounds and Ulsoor Lake on one side and the Bangalore Race Course and Brigade Grounds in the south. Bangalore City Junction Railway Station is the nearest railhead.